We've been waiting for front suspension (modern Mustang) parts, and until these are welded in place there is no way to install the engine/transmission assembly. The new suspension modifications require cutting out part of the frame and relocating the front engine mount, so there's no point in creating temporary transmission lines and other stuff to test run those components. We decided to wait until they were neatly tucked back into the frame. Removing the rear drums (these were new replacements, by the way, that had never been used) we found someone had replaced the shoes and slave cylinders. It was obvious that these components had never been activated, but the mechanic who did the work used the original springs. We ordered new hardware — along with a new parking brake cable — and continued the project. 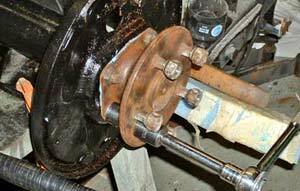 And yes, we did disassemble the brake cylinders and made sure there was no rust. We didn't bother to show the cleaning steps, since you all know how to clean, wire brush and scrape. The process to get it ready for paint took about two hours of mind-numbing tedium. We primed the housing with etching primer and painted it black, after which we replaced the brake backing plates. These were small enough to sand blast and powder coat, by the way. 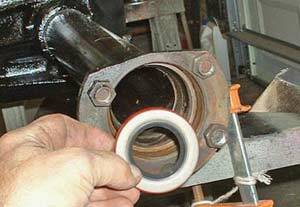 We installed the new bearings after not-so-carefully removing the old ones. 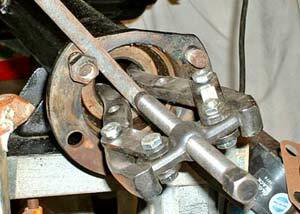 Axle shaft bearings are pressed on at the factory, accompanied by a spacer (also pressed on). 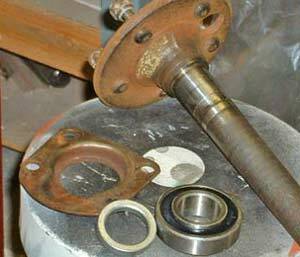 These are a nightmare to remove after so many years, so most shops use a cutting torch to remove the old bearings. We used a grinder to cut through the old bearings and spacers, then tapped them off with a hammer. This is our starting point. 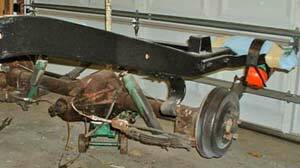 As you might recall, we built a cart for the T-Bird body, so that we could wheel the chassis clear of the body. The blue foam pads on the frame are there so that we don't scratch up our garage doors. These bearings are pretty well here to stay. The only way to get them off is to cut them off with a grinder. After cleaning the axle shafts we spread out the parts and pressed on the new bearings and spacers, using our 12-ton shop press and suitable blocks. The new bearings and spacer ready to be pressed on. Before replacing the shafts we removed the old grease seals and replaced them with new ones, being careful not to tap them in crooked. Once we put in all the new paper seals (these go between the housing end and backing plate and between the backing plate and end plate) we torqued the axle end plates to the brake backing plates. 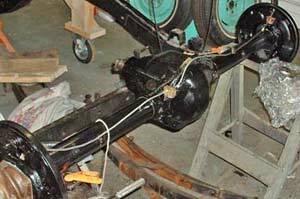 We then assembled the brake parts and reinstalled the drums. 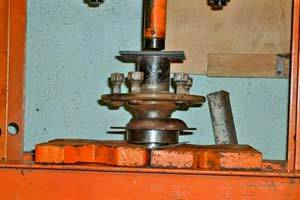 Bearings being pressed on using our 12-ton shop press. Pulling out the old grease seals. This new seal is gently tapped into place, care taken that it doesn't go in crooked. Once the differential cover was removed and all the icky fluid drained we could examine the ring and pinion gears for wear and lash (too much "play" can cause noise and premature wear.) 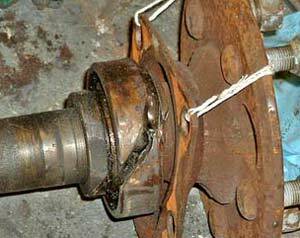 Although the car seems to have racked up nearly 100,000 miles, the wear on the gear teeth was barely noticeable and the overall lash was within tolerances. This was more good news, since we didn't want to rebuild the "pumpkin" unless we needed to do so. After some discussion we decided to leave the assembly alone, replace the input (driveshaft yoke) seal and rear cover seal, and put the whole thing back together. Note: If this were some other component like the engine or transmission we would have gone the extra distance to replace the parts. Since, however, the rear end is a modular unit and can be repaired/removed at any time, we chose to leave it alone. We installed new brake lines on the housing and tightened everything up, making sure to tape over the flexible coupling's female opening to keep moisture out. 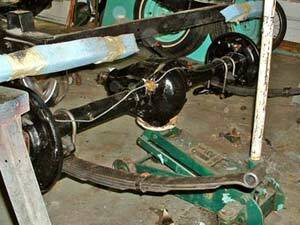 The leaf springs showed good arc and they looked intact, but after removal and disassembly we saw that they were the 50 year-old originals (look at rearend11 photo and notice the rusty springs). Overall corrosion wasn't terrible, but was enough to spur us to order a new set of leafs. We found a new set (including shackles, bushings and U bolts) for $220 on the internet at www.espo.com. After measuring to verify the new springs were the correct lengths (they were) we mounted them on the rear end housing's spring pads. Before tightening the U-bolts we measured the position of each pad on the springs to make sure the rear end was centered and running parallel to the car's frame. The new brake lines are in place. Rear end attached to springs with U-bolts. 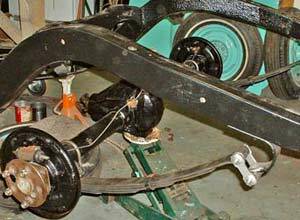 Using a floor jack we carefully moved the now-assembled rear suspension to its frame location and re-measured the housing's distances from the spring mounts to assure parallel alignment. We installed the bushings, shackles and bolts and tightened everything to specification. Moving the rear end into place under the frame. Not quite. We will go back and re-measure our distances after the car is restored and sitting at its correct ride height. 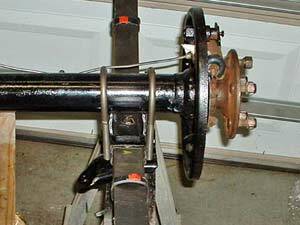 We will also wait until then to install a Panhard rod or anti-sway bar to assure these are in the correct plane.